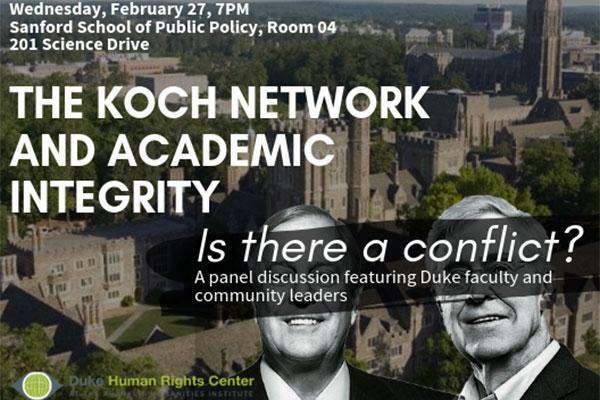 The Koch Network and Academic Integrity: Is there a conflict? The network of arch-right billionaire and multi-millionaire donors built by Charles and David Koch is funding a vast apparatus of organizations to radically change public policy and the law on matters from environmental protection and health care to labor and tax policies and reproductive rights and voting, even to alter the U.S. Constitution. The Charles Koch Foundation is now funding centers on campuses, too-including at Duke and UNC. Will this presence just expand dialogue or does it represent something more disturbing? This panel of faculty and community leaders will explore the impact on our state of the Koch political operations (and those of those of their North Carolina ally, Art Pope) to address vital questions for the future of our country, our state, and our universities. Parking will be free in the Sanford lot.